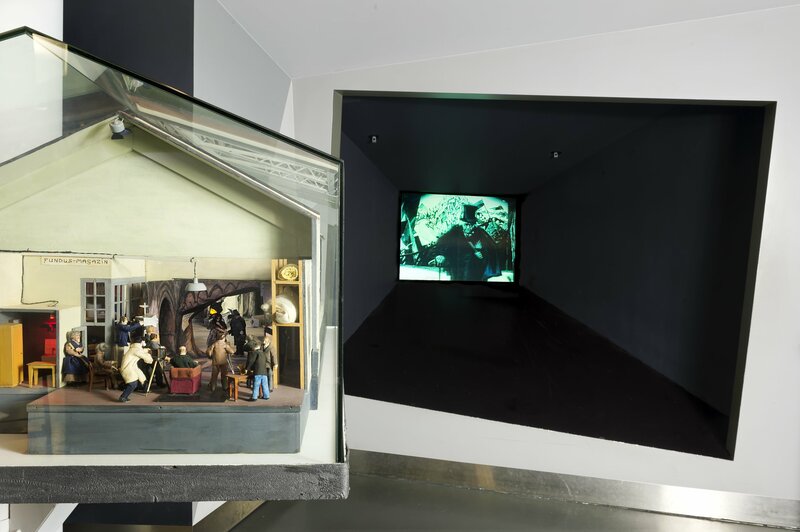 The permanent exhibition focuses on its two defining media – film and television – from their origins to the present. 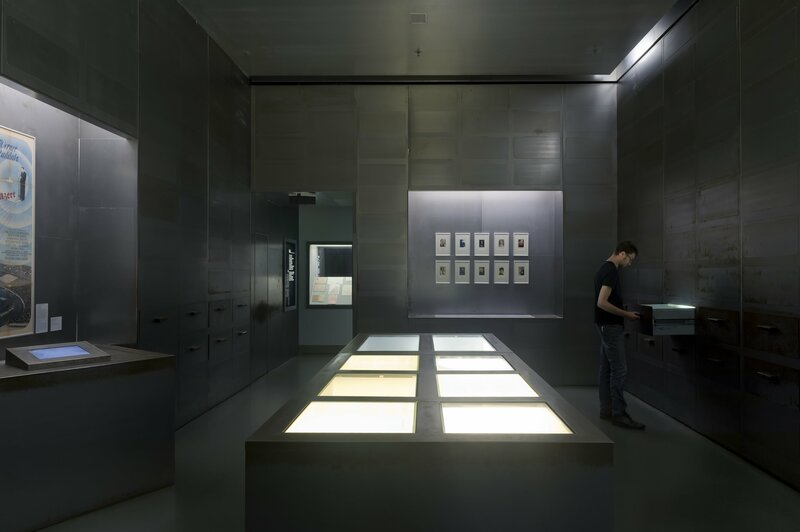 In keeping, the exhibition on the history of film ranges from an 1895 newspaper advertisement highlighting the Wintergarten’s film program to exhibits representing the most recent recipients of the Deutscher Filmpreis (German Film Prize). In addition to the evolution of German film history, international relationships – to Hollywood above all – are a further emphasis. 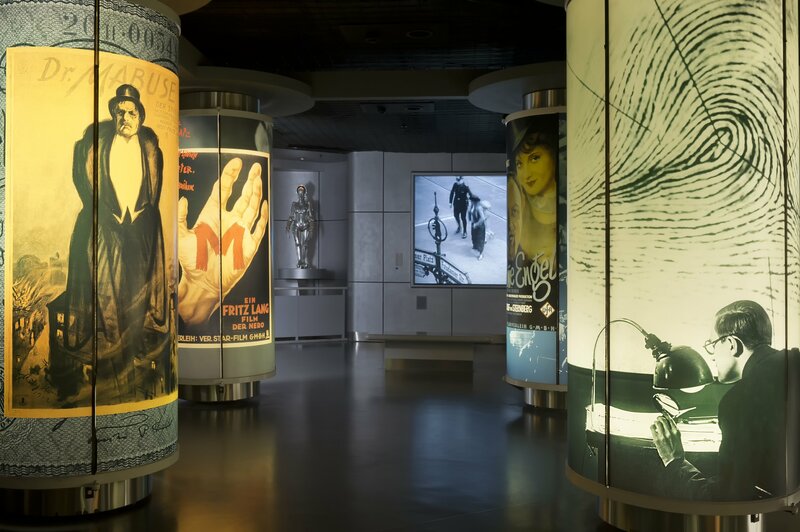 The achievements and fate of film professionals who were driven into exile by the National Socialists are paid homage in a room devoting special attention to this subject. 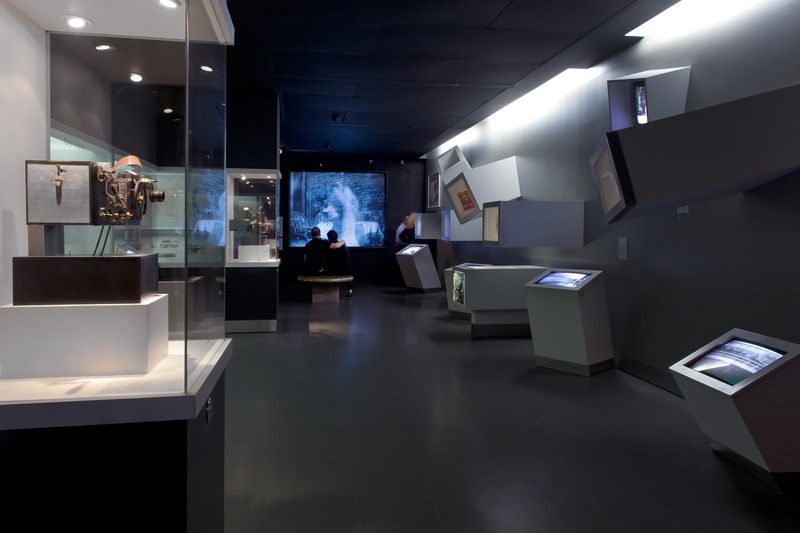 In contrast, the display on German television spans from the first experiments with live broadcasts of electronic images to their universal availability in contemporary everyday life. 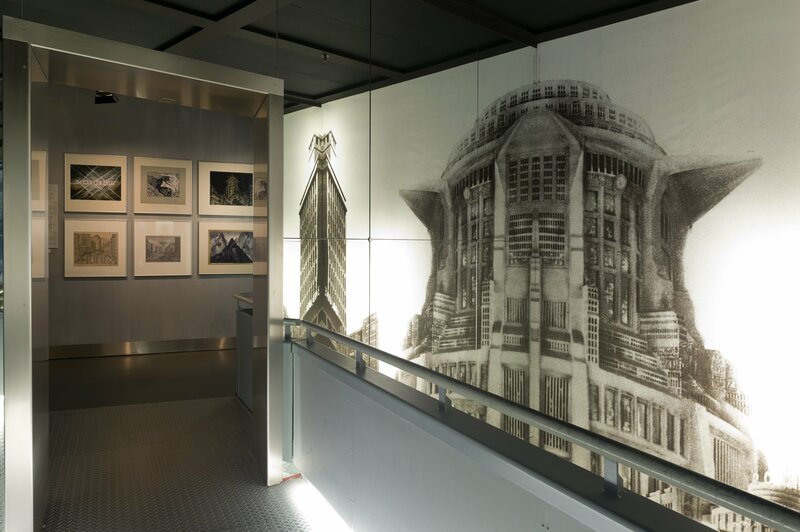 The permanent exhibition establishes relationships between this media’s history to culture and society, as well as to political events. The radical changes in the arc of German history – from the German Empire to the Weimar Republic, from National Socialism to postwar developments in the Federal Republic of Germany and the German Democratic Republic, and in recent times through German Reunification – has continued to offer both film and television ever-evolving and in part drastically changed or limited artistic, economical and political conditions. Phases of comparatively free development and those of rigid control followed closely one upon the other. 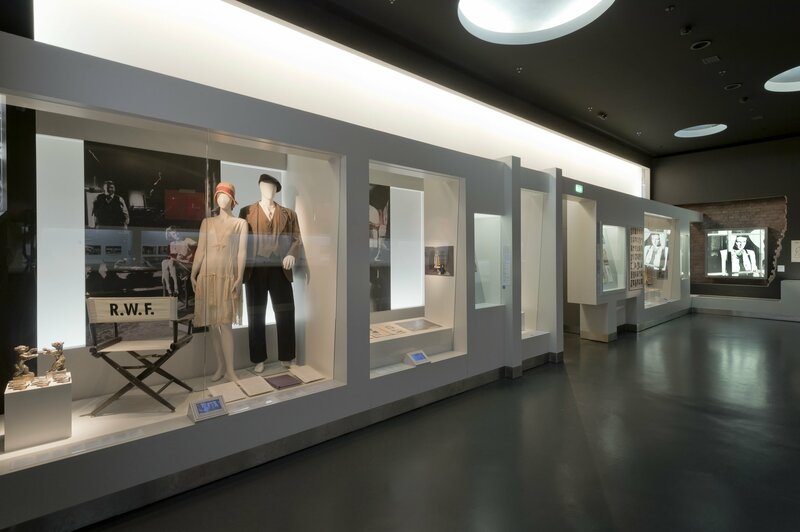 Unique exhibits from the rich collections of Deutsche Kinemathek and central film scenes trace the most important of these developments. 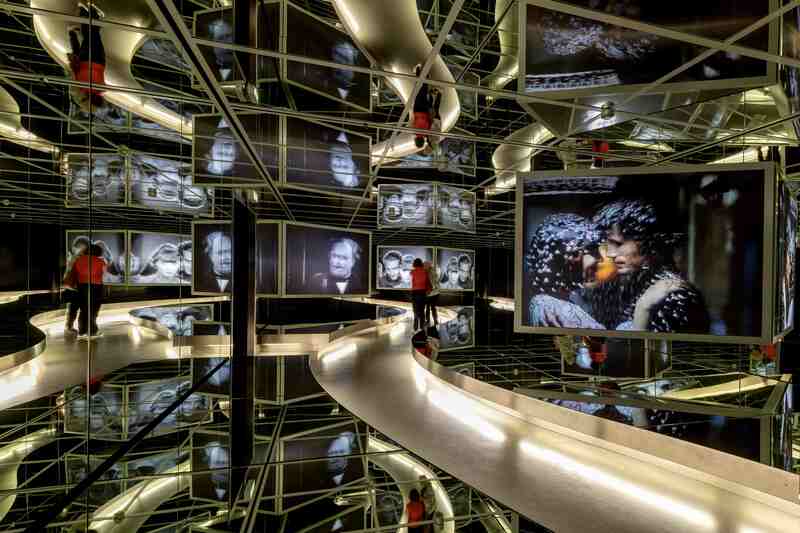 In 1962 the Deutsche Kinemathek was founded to preserve the audiovisual heritage. 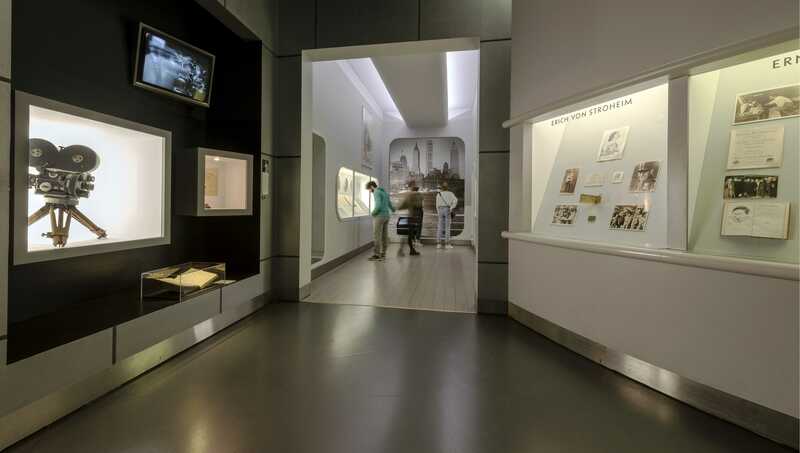 Since 2000 it has been presenting its treasures at the museum on Potsdamer Platz. 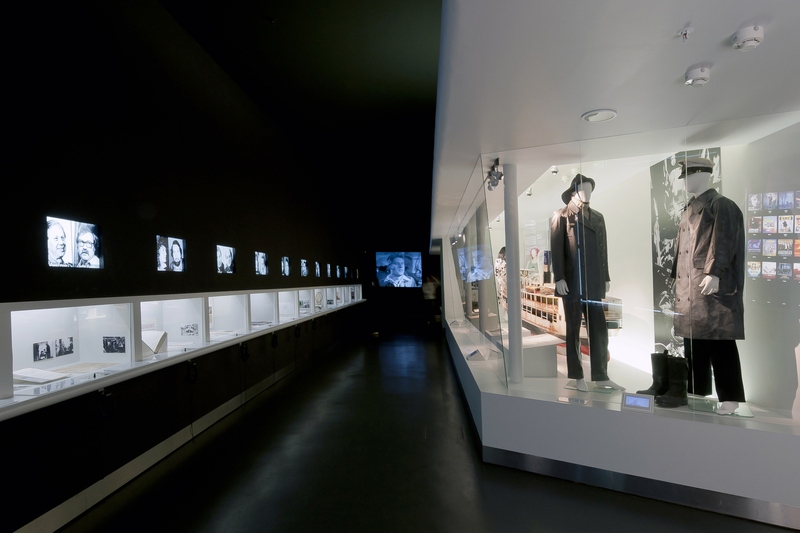 The exhibition catalog features selected items of German film and television history, among them the futuristic drafts for Fritz Lang’s Metropolis, Marlene Dietrich’s costumes, documents for Michael Haneke’s The White Ribbon and material from Loriot’s œuvre. Cinema is a 19th century invention. In 1895, the Lumière brothers in Paris and the Skladanowsky brothers in Berlin organized the very first cinematographic events. In the space of twenty years, cinema became a major industry, both economically and culturally. Oskar Messter is considered a great pioneer of German cinema. He was a producer, director and distributor, who also manufactured film projectors and cameras. Women were the stars of early German cinema. Many of them, like Henny Porten, were German, but Fern Andra was American and Asta Nielsen was Danish. Regardless of their mother tongues, the language of silent films was international. When World War I broke out, cinema was put to military use and exploited for national propaganda. After the chaos of World War I, it was hoped that Germany would listen to parliamentary democracy’s voice of reason, but the ghosts of the war did not vanish. In this key film, Das Cabinet des Dr. Caligari (D, 1920, directed by Robert Wiene), the horrors of war find a surprising, intuitive expression. It is a story of murder and hypnosis – a tale of society that seems to consist of madmen. The film is a riddle on a number of levels, confusing in both topic and style. In the words of one of the film’s architects, “As an art form, a film must become a living print.” The décor and shadows thus underscore the eeriness and unreality of the plot. The era from 1918 to 1933, between the birth and death of a republic … Conjuring national myth on the screen was, from a left-wing point of view, the expression of an anti-republican attitude. Inversely, conservatives polemicized against “Proletkult” and films with social messages. Ernst Lubitsch, F. W. Murnau, Fritz Lang and G. W. Pabst were the era’s most prominent directors. Its stars were Pola Negri and Brigitte Helm, Emil Jannings and Otto Gebühr, Louise Brooks and Marlene Dietrich. Everyday life and myths, triviality and trashiness, technology and horror: These were the elements that took shape in the films of the Weimar Republic. The warning signals that would herald the coming dictatorship were all too obvious. Skyscrapers rising like mountains, seas of buildings, factories full of machines, catacombs, the Tower of Babel, a cathedral, and heavenly gardens. In Fritz Lang’s film Metropolis (D, 1927) architecture exposes power structures and hierarchies, the difference between freedom and oppression, might and powerlessness. This production is early science fiction and a masterpiece of film architecture. A young woman, a savior figure, confronts her machine image, a robot. Evil battles Good, and Good prevails. In her script, Thea von Harbou wrote: “The mediator between the hands and the brain must be the heart.” Fritz Lang’s film blends the documentary and the visionary, utopia and apocalypse. In the 1920s, Berlin became the center of European film, but Hollywood was recognized as the industry’s true capital. Even in the early days of silent films, German-speaking artists from Germany and Austria, like Ernst Lubitsch, F. W. Murnau and Erich von Stroheim settled in California. With their help, the American film industry sought to secure economic success in Europe. Starting in 1928, sound films captured the American market. In Hollywood, German actors and directors worked on German-language versions of the original films. Many of them did not stay long in the United States, and only a few managed to put down permanent roots. When the National Socialists took power in Germany in 1933, they formed the core of a German community of exiles in Hollywood. No other German film personality would make such an impact through their acting career like that achieved by Marlene Dietrich. Her rise to world fame – both in Berlin and Hollywood – began in 1930. She starred in six Hollywood films directed by Josef von Sternberg. Morocco (1930) and Shanghai Express (1932) were their greatest joint successes. Marlene Dietrich often spent long periods of time in Europe until 1939. She refused an offer by the German propaganda minister, Joseph Goebbels, to return to Germany. Marlene Dietrich actively supported the fight against National Socialism in 1944 and 1945. She performed in USO shows for American troops in Africa and Europe. In Billy Wilder’s 1948 satirical comedy A Foreign Affair, she plays a German nightclub singer. The film is set in postwar Berlin. Marlene Dietrich’s roles, her songs and her outfits breathed provocation. Her appearances in men’s clothing on the screen or at social events deftly overstepped the limits of traditional gender roles. Admired by men and woman alike, she would become a 20th century icon. In 1936, the summer Olympic Games were held in Berlin. The National Socialist government exploited the occasion to present itself as cosmopolitan and tolerant. Leni Riefenstahl was given the commission of documenting the games on film. 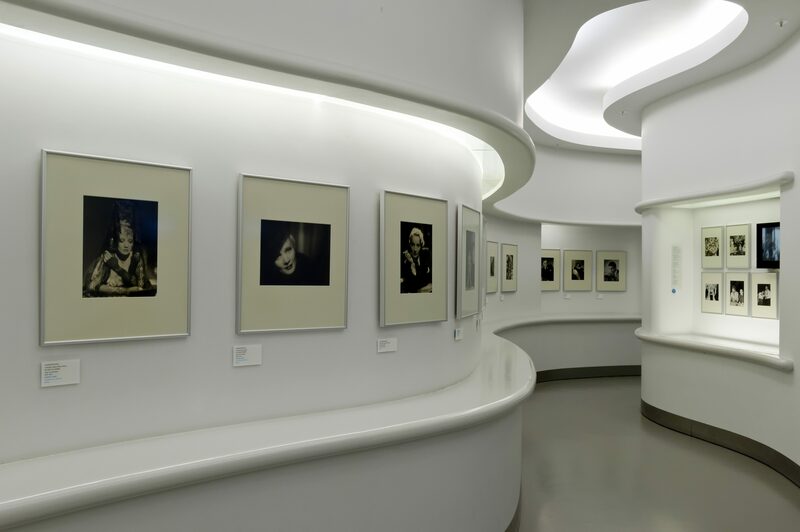 Her imagery drew its strength and dynamic force primarily from the stylistic elements of modern photography and montage developed in the 1920s. Her two-part film Olympia celebrated the beauty of the athletic body. To this day it remains a masterpiece of the art of staged documentary film. Two years before the Olympic Games, Leni Riefenstahl had idealized a National Socialist party conference in Nuremberg, portraying it as a Triumph des Willens. In 1933, Adolf Hitler became Reich Chancellor. The National Socialists destroyed democracy in Germany and instituted a dictatorship. The German film industry collaborated with the Nazi regime, Jewish employees were fired and “national” films were offered. Artists working in film became perpetrators, victims and blind followers. Light entertainment dominated German film production under the “Third Reich.” Besides anti-Semitic and warmongering films, comedies and revue films were the main fare. Such movies offered an escape from day-to-day reality, especially after 1939 when the Nazis invaded Poland, leading to the start of WWII. The Latin word “exsilium” connotes banishment and life as an alien – but also asylum and salvation. Escaping Nazi Germany meant hope of survival for Germans of Jewish origin, for the political left, for bourgeois humanists and for advocates of modern art. As the Wehrmacht began to occupy more and more countries in Europe, refugees were forced further and further afield. They sought refuge overseas, particularly in the United States. Hollywood became a haven for many film artists, and Paul Kohner’s agency became the first place to go for help. However, salvation also meant loss: loss of home, culture, language and identity. Yet, in the midst of loss, the exiles could already imagine returning to a Germany free of dictatorship. The first four decades after the end of World War II were characterized by the division of Germany. In the German Democratic Republic, DEFA’s film production was state-controlled. Conflicts with censorship occurred again and again. Almost an entire year’s production was prohibited in 1965, mostly films on current topics. A younger generation of directors publicly appeared in the Federal Republic of Germany in the mid-1960s. They opposed the predominance of entertainment films. Their work became internationally known under the concept of New German Cinema. Filmmakers in both East and West Germany continued to approach contemporary subjects during the 1970s. The images of Germany created by the directors on display are exemplary and are facets of an extensive panorama of postwar German film history. At the beginning of the 1980s many German directors began to work abroad in Europe and the USA. The first signs of political change, which ultimately occurred in 1989, became visible in East German film. After the fall of the Berlin Wall, the next generation of filmmakers also confronted themes about German history in feature films and documentaries. Films about the National Socialist dictatorship, RAF terrorism and the fall of the Berlin Wall became popular successes both within Germany and internationally. The images of Germany by the filmmakers assembled here are often very personal. However, the creation of German films during this period was also defined by international co-productions as well as the influential role of television.